1. Focus your fire on enemies that have yet to act this round. If you can remove a figure from the table before it acts, you have saved your forces from facing that figure’s Actions. (n.b. This is sometimes referred to as tempo gain). 2. Schwerpunkt. This is the principle of focusing your forces on a point in the enemies defenses to achieve victory. Applied to Imperial Assault, this translates to focusing your forces and quickly destroying powerful figures/deployment groups so you gain a numerical advantage. Doing so usually means using more of your troops to destroy a key enemy figure (e.g. Elite Trandoshan Hunters), whilst one or two other figures run interference and defend or tie-up the enemies less-powerful troops, like Stormtroopers. If successful, you can swing the balance of forces to your favor and then mop-up the weaker troops afterwards. 3. Primarily for the Rebel player in the Campaign game: Open doors with your first or second figure’s activations – don’t end your turn by opening a door and allowing the Imperial player to then hose you with new troops! 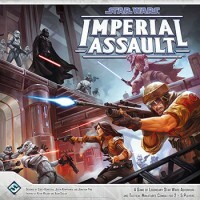 Imperial Assault is the big holiday bigness – and knowing the expansion machine that is Fantasy Flight it is only going to get bigger. 2) THOSE ID Stickers *shudder* – they are kind of silly. You would think for 100 smackers they might throw in some colored base cozies like Arcadia Quest. Things are going to get confusing when all 9 Stormies hit the table – but some of the gravitas is lost when the numbers make them look like they just got back from the Tatooine Dry Cleaners. If you have artistic talent please jump to @Stratagon’s helpful tip Squadron Based Painting Guide three cubicles down – because it is genius and it is through some back and forth with him I came up with my own solution for the artistically untalented. Prismacolor markers are copic paint markers available at any art store in your corner of the galaxy for a couple of dollars apiece- useful for adding bright vibrant watercolor looks to any sketchpad or segregating your stormtroopers. I ran the markers along the base circumference edge and then rolled the edges across a paper towel to sop up the excess. The dye took to the plastic enough to create a stain band around the base – just enough for the eye to catch without being obtrusive. If there was a second Grey Standard Deployment Card for a unit set I gave them a green base band. I used Grass Green – it felt sort of reserve/reinforcement in color. Models destined for Elite Status mark ups received a red base band. I did two passes one in Scarlet and then one in Crimson. I wanted the elite red to be a little more vibrant and stand out in a ‘Here’s comes trouble…’ sort of way. This way each deployment card comes to represent a color of a squad/figure and for multi-unit deployments you can just place an ID counter on the figure and one on the card for each unit to stack wounds on. All that’s left to do is place that sticker sheet under the cardboard divider, promptly forget about it, and sleep the sleep of the righteous. The company “The Broken Token” makes great organizing inserts that fit into the games original box and optimize storage. They are a little pricey (45 USD on amazon) but they work well for a game with this many components and also hold expansions and sleeved cards. While playing encounters, don’t forget to search the crates for supplies, especially if you’re facing eminent defeat. Not only can the items found help you in your current quest, but they also provide money which you can spend on better equipment for your hero. I’m currently playing a 3 player campaign. 2 of us are playing 2 Rebels each. Instead of giving 1 experience point to the player, we are giving 1 to each Hero. We then are giving the Imperial player more Exp as well. We then don’t have to wait so long to get some of the better skills of the Heroes. It appears I’m not the only one to find this game incredible hard for the rebel players. As I’m likely soon gonna embark on a second campaign I’ll add one of the two following changes whether or not I’ll be Imperial or Rebel. currently alternative 2 seems most likely as it will allow for more then two dice but at a high cost. If you are looking for sleeves fitting the hero cards, you may want to look into a company called Swan Panasia. They produce sleeves (for a game called Talisman) that measure 103mm X 128mm. They are a perfect fit for the hero cards. The only drawback is that the sleeves are quite thin. Having said that, they come by a 100 in a pack and I haven’t had one break on me yet. You can also use these sleeves for Descent Journeys in the dark 2nd ed. (by FFG). The hero cards in that game are of the same size.